This chapter concentrates on the on-line buying behavior of gay male fashion innovators for luxury clothing. The author provides evidence that Internet shopping intent for luxury fashion items has great potential as a novel and innovative segmentation tool and that the Internet serves as an efficient platform to communicate to this target group. An empirical analysis of the data indicates that the degree of fashion innovativeness directly influences male gay's on-line buying behaviour for luxury fashion items. 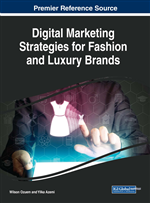 The chapter concludes with a number of managerial implications that luxury fashion market practitioners and researchers can adopt to develop effective on-line marketing, communication and branding strategies for gay male fashion innovators, which represent a lucrative market segment in the luxury fashion industry. The majority of research on fashion innovativeness has targeted female consumers, leaving the area of male fashion innovativeness under-researched in the literature. A widely shared view exists throughout the literature that women are more fashion conscious than men and examples include Auty and Elliott (1998), Bloch (1981), Browne and Kaldenberg (1997), and Paoletti and Kregloh (1989). A number of theories have been put forward in an effort to account for this, including Kaiser (1997), McCracken and Roth (1989) and Craik (1994). The number of published academic research reports on male samples is almost non-existent; exceptions include those of Darden and Reynolds (1972), Baumgarten (1975), Shin and Dickerson (1999), and Beaudoin et al. (2003). In addition to the studies concentrating solely on men, some insight is provided by research where the sample population has included both males and females. In this category, studies have investigated, for example, the symbolic meaning of clothing brands (i.e. Auty & Elliott 1998, Elliott 1994) the effects of brand names on product evaluations (Forsythe 1991), and personality and clothing involvement (Auty & Elliott 1998, Browne & Kaldenberg 1997). Unfortunately, in many cases, gender differences are not reported, and if they are, they are explained in relative weighting or proportional terms. Nevertheless, during the last decade and particularly in the USA, an increased interest in various aspects of men’s fashion consumer behaviour and their buying patterns can be seen amongst consumer and cultural marketing researchers (Aidan & Ross 2005, Aidan 2014), but so far, no studies have emerged focusing solely on the male (either heterosexual or homosexual) fashion innovator group and their symbolic use of clothing brands. This dearth of research per se clearly denotes the need for doing research in this particular field. Aidan and Bayir (2007) presented a practical application of self-concept theory in profiling gay male fashion innovators in London. The results of the analyses regarding demographics postulated that fashion innovativeness was not significantly correlated to education, relationship status, age, income levels and race for gay male fashion innovators in London. Closely related to their findings, this paper will particularly test whether fashion innovativeness of gay males is associated with on-line shopping for fashion items. If fashion innovativeness is positively correlated with on-line shopping intent then one can argue that self-concept profiling can be used to define the personality differences between those who prefer physical versus e-shopping.